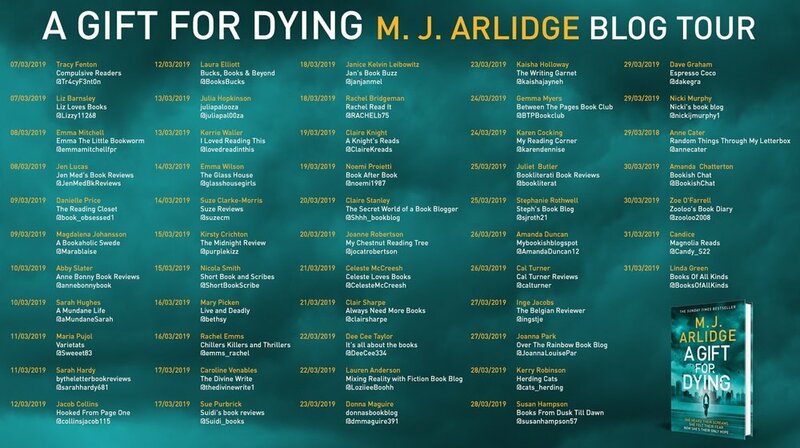 I’m incredibly excited to be today’s stop for A Gift for Dying! Let me start off by saying, this is one of those books that you cannot pigeon hole into a specific category. It’s a little suspense mystery, a little dash of police procedural and a little psychic mystery all rolled into one story. Most importantly, IT WORKS. The entire premise of the book being that Kassie can predict how and when people will die had me a tiny bit skeptical starting off with this book. I was worried it would take a dive into completely unrealistic voodoo and I would lose total interest in the plot. How wrong I was to worry! I completely appreciate that despite this somewhat supernatural element to the story, it’s a story that is otherwise grounded by complex and broken characters and that makes it compulsively readable. I loved Kassie’s character. That this gift/curse would be something that would isolate her in life was entirely more believable than any other situation that M.J. could have put her in. I spent the entire book feeling so sorry for Kassie and rooting so hard for her to come out on top in the end. Even in some of her more crazy actions - I know I’m getting older when my reaction to young characters making dangerous and impulsive decisions is to want to sit them down and lecture them, but I digress - she was still relatable and believable in how she was trying to tackle the increasingly terrifying position she was in. I think I also just very much appreciated that M.J. never took the easy way out with this plot point - no one just outright believes Kassie when she tells them what she can see, and that is something I ADORE in a book - a very honest reaction to off kilter news like that. I won’t offer any spoilers, because this is one of those stories you want to go into knowing very little so you can fully enjoy how the story plays out, but I will say that I was surprised to be moved so emotionally by this book in parts. It is very rare for me to really have an emotional connection to a mystery/suspense/thriller but in this case I did. That has piqued my interest in checking out more of M.J.’s work, because quite frankly, it was the exact right combination of suspense and drama to make this a highly refreshing read for me this month. If you are a bookworm who likes your suspense with a little bit of a wild and unique twist, this is CERTAINLY one I would recommend for you. It’s a compulsively readable summer pick, and will make for the perfect companion while soaking up these sunshine rays!